What should you do if you have a mold problem in your home? Many homeowners and experts alike would suggest treating the area with diluted bleach (active ingredient sodium hpochlorite). However, there is one problem with this suggestion. Bleach does not kill mold. The idea that bleach kills mold is one of the most common misconceptions encountered here at NORMI. Bleach is a powerful oxidizer, and can sanitize surfaces covered in certain kinds of bacteria. However, it is not the product to use on surfaces covered in mold. We first noticed a problem while working with roofers to kill mold growing on shingles. We used a combination of surfactants, detergents, and bleach to lightly spray on the roof. It worked very well initially, but we found that the mold grew back within two years. Since then, the “Journal of Forest Products” commissioned a study by Oregon State University on the efficacy of bleach on mold. They found that the stains caused by the mold will disappear, but the microflora remains. Essentially, the unsightly discoloration is gone, but if the surface has enough moisture and organic material the mold will be able to grow back in larger qualities than before. 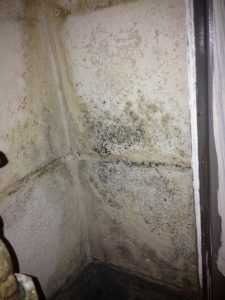 This is the reason why that same mold spot keeps appearing in your shower, no matter how many times you clean it off. NORMI™ recommends using green technologies like natural enzyme cleaners instead. When you use the right kind of anti-microbial, the mold and the underlying bio-slime will be removed permanently. As an added bonus, you and your household won’t be exposed to the dangerous fumes from bleach.